March 8th is International Women’s Day. We want to kick off this month, with a salute to all Dutch Caribbean women past, present, and future, famous or unknown, by celebrating their accomplishments and future achievements while safeguarding, producing or sharing the Dutch Caribbean cultural heritage. 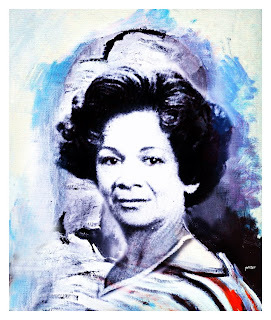 And who better to kick off this month of Amazing women with, than with the multi-talented Aruban artist Nydia Ecury, whom we commemorate today as tomorrow March 2 will be 1 year that she passed away in Curaçao at the age of 86. Ecury was born in Aruba on February 2, 1926 but lived in Curaçao since 1957. Nydia Ecury was a true performing artist in the Caribbean tradition. She co-founded the Thalia drama group, she translated famous foreign plays into her native language Papiamentu, and she was an actress. She wrote prose, poetry, and children’s stories in Papiamentu, Dutch, and English. She also worked as a translator. She published six collections of poetry, including Bos di Sanger [Voice of Blood] in 1976 and the bilingual Kantika pa Mama Tera / Song for Mother Earth in 1984. Ecury was an ambassador of Dutch-Caribbean literature. She represented the Netherlands Antilles more than 20 times at literary festivals in the Caribbean, Venezuela, the Netherlands, and the United States. She was best known for her poetry recitals, often performed with musical accompaniment. She appeared as Mama Grandi in the film Almacita di Desolato (1986) produced by Norman de Palm. She also gained fame with her one-woman show Luna di Papel [Paper Moon] in 1980. For her cultural contributions she was awarded a Netherlands Royal decoration three times. Curaçaoan pianist Wim Statius Muller composed the waltz Nydia in her honor. In the last few years of her life, Ecury had Alzheimer’s disease. But in 2011 she appeared on Di Fiesta, the Christmas CD of Curaçaoan jazz and world music diva Izaline Calister, singing the lead vocals of ‘Un Niño Krioyo.’ And in 2012 Ecury appeared on the personalities’ calendar of the New India Assurance company, which was designed by her daughter Caresse Isings. Ecury is also survived by her son, Alexander Isings. Nydia, Thank you for your contributions to the Dutch-Caribbean cultural heritage and for being a daring and inspiring role model for women everywhere. Information compiled from a previous article by Peter Jordens who used the following sources: Caraibisch Uitzicht and again, You Tube, and Konosé … Who’s Who in Curaçao (2007). Pictures compiled by Giselle Ecury from family album. Dutch speakers can read her thoughtful and eloquent goodbye to her aunt at Caraibisch Uitzicht. Could you supply a jpg of Nydia Ecury for use in my book, Caribbean Women’s Art, along with permission to publish?